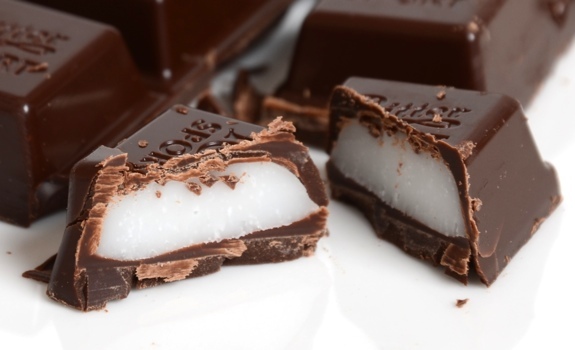 A Ritter Sport peppermint chocolate bar, with one square cut in half to reveal the filling. T&T is a curious store, isn’t it? It’s part Chinatown market and part western grocery store, with a smattering of other international flavours thrown in to confuse and disorient me. While it’s common to find Hi-Chew (yum!) and Pocky (double yum!) at the rack next to the till, I certainly wasn’t expecting to see Ritter Sport chocolate bars from Germany. I picked up the peppermint one. The Look: See above. It’s a square bar, wrapped in turquoise plastic. The multilingual packaging gives it some international cachet. Each break-apart chocolate square is filled with a peppermint fondant, much like a Caramilk is filled with caramel. But the filling is more solid than runny. The Taste: Like eating a peppermint patty, but with sharper corners. The chocolate is fruity, and the mint is strong, natural and mouth-cooling. The filling is satisfyingly sweet, with a smooth texture that dissolves in your mouth. I really like it. 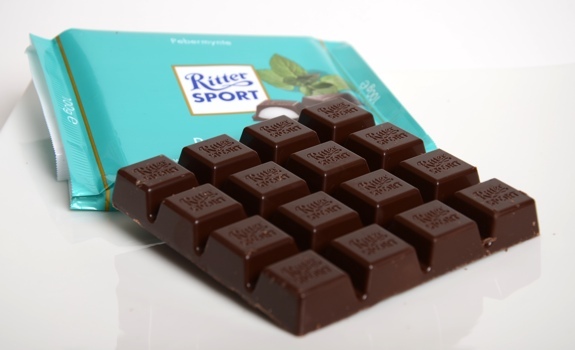 Each regular sized Ritter Sport chocolate bar is a square further divided into 16 smaller squares. Cost: $2.97 for a 100 gram bar at T&T in Calgary. Availability: Not to hard to find. Your best bet is to look in shops that carry European chocolates. Saw the same bar at Rustic Bakery in Calgary. Nutrition? : Per 6 pieces (38 grams): 190 calories, 11 grams of fat, 0 mg of sodium, 1 gram of fibre, 2 grams of protein. The verdict: Super yummy. A nice import chocolate bar. I imagine I’ll be eating more from Ritter. 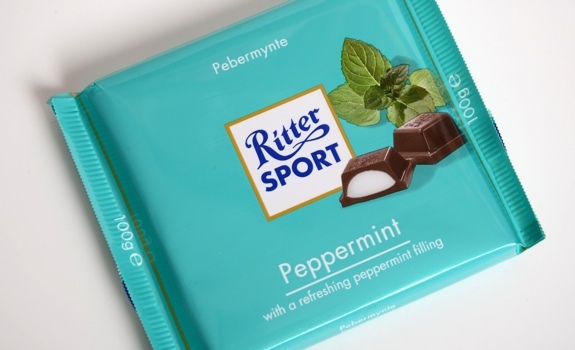 The light blue wrapper of a Ritter Sport peppermint chocolate bar. I saw these bars in a grocery store not long after I read this review, so I decided that I would indulge, and buy one for myself. Oh. Em. Gee. I love peppermint patties, but this, this is WAY better. Love the smooth chocolate, and the cool peppermint. It doesn’t seem as sweet as the peppermint patties, which I like, and the chocolate hit is better. I will definitely be buying this again!